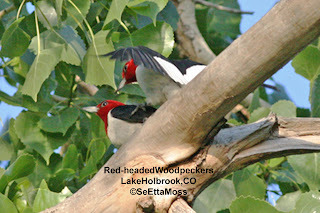 While birding at Lake Holbrook, north of La Junta, Co, a few days ago, I was delighted to find four Red-headed Woodpeckers in a small grove of trees across the road from lake. I am always happy to find these woodpeckers as they are declining in a number of areas. These woodpeckers were calling and tapping repeatedly, chasing each other and mating. On several occasions I observed a pair copulating and I was able to photo-document one of these. Starting with the second one, these pics chronologically document this copulation as it occurred.